You’ve been warned. As a matter of fact, I warned you when I came back to the blog that yes, I would be sharing some lower calorie/lower fat dishes (preferably dessert hehe) but that I would still be…well… ME and would continue sharing the type of goodies that make you have to get your fat girl (or fat boy as the case may be… and while I’m thinking of it, how come it seemed ok to say “fat GIRL” instead of woman but I had to stay an urge to write “fat MAN”? What’s up with that backwards “I must have been born in 1825” sort of thinking?) pants and make you sob uncontrollably when you get on the scale. Why? Because I enjoy torturing you. Heck, who am I kidding. I’M the one who has most of a creamy delicious cheesecake taunting me here. I suppose just burying my face in it and inhaling would be strange huh? I think we all know by now that I love anything lemon. I don’t care if typically, it’s considered a Summer food and all the cuter, prettier and more popular bloggers *grins* have moved on to all pumpkin/maple/apple/cinnamon/elephant/cranberry/squash/turkey recipes. I’m a rebel! A rebel I say! Or I was just in the mood for lemon. Whatever. But really; I like lemon. Lots. I like These Lemon Crumb Bars , I like This Lemon Curd. A LOT., I like These yummy cookies and I also absolutely LOVE cheesecake as shown here . So give me a chance to combine the two and I’m one happy woman (notice I said woman and not girl :-p ) It uses white chocolate which my friend Bel says isn’t really chocolate at all, but that’s ok; I love her anyway. She loves pumpkin as much as I do so she can’t be ALL bad. White chocolate not being a flavor that shouts itself from the rooftop, it adds more of a creaminess and vanilla flavor to this rather than a pronounced in your face chocolate flavor. But creamy is never a bad thing. I like creamy. And lemon. And white chocolate. So yup, I like this cheesecake. Too much. Please come take it from me before I have to go back to my fat girl pants. Better yet, make it yourself, have no self control, eat far too much and then tell me about it so I can feel better. Misery loves company and all that rot. This originally comes from Taste Of Home. I didn’t change much at all. I gave it a graham cracker crust cause I was feeling lazy and I added a touch more lemon juice. Otherwise, all Taste Of Home here. Combine crust ingredients and press into the bottom of a 9 inch springform pan. Bake at 325 degrees for 10 minutes. Add the eggs, then beat on low speed just until combined. Remember, I’ve said it before, unless specifically instructed, you never want to overbeat a cheesecake batter. It adds air to the mix which can cause those unsightly cracks on top. Put a pan (I just use a cake pan) into the bottom rack of the oven. Carefully pour the boiling water into it. Put the cheesecake into the oven, middle rack. Bake at 325 for anywhere from 65 to 85 minutes. Mine took about 80 minutes. The sides should be set but the center of the cheesecake should still be jiggly. Cool on a wire rack for about ten minutes, then unlatch the side of the pan and let it cool completely. Refrigerate at least 4 hours before cutting and to get good cuts, use a sharp knife dipped in very hot water. Serve with whipped cream and lemon peel garnish. Or just bury your face in it and inhale. This entry was posted in cheesecake, Citrus, Desserts, lemon and tagged cheesecake, dessert, lemon, white chocolate by Janet. Bookmark the permalink. You’re a baaaaaad girl. And that’s why I love you. Janet this is wonderful. I love cheesecake, I love lemons, I love chocolate and I love you! It doesn’t matter what season it is, I love cheesecake and lemon cheesecake and white chocolate anything and what do you mean this isn’t diet food???!!!! I love your warning in the title haha. This looks great! Nevermind dieting – this cake is absolutely a knock-out! The addition of lemon must be so appealing – brava! I need to get on that cool bandwagon and start making some elephant! 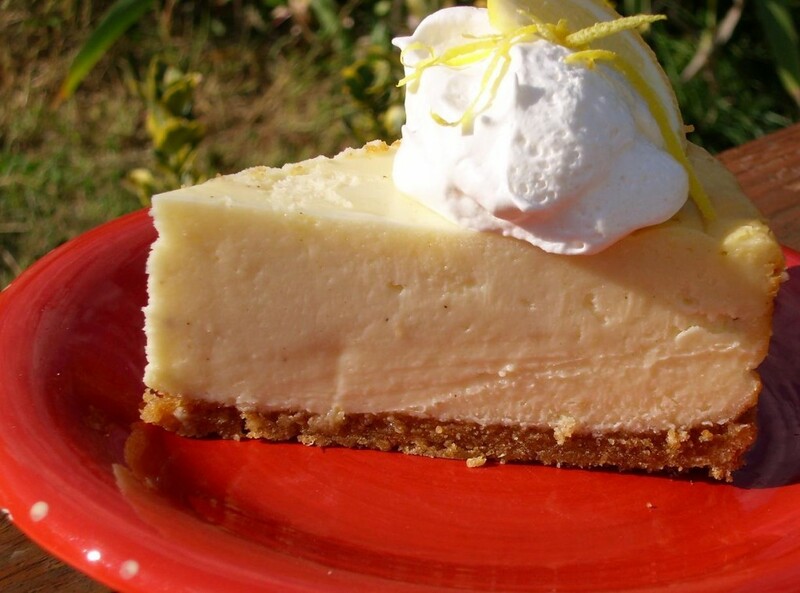 I think lemon is good all year – and who doesn’t love a good cheesecake!